This is the first Patrick Ness book that I have read. I listened to the audiobook which was narrated by Jamie Glover. The narration was fantastic as was Ness’ writing. I thought the book started really well with getting to know George who encounters an injured crane in his garden and then the story line changed and George’s daughter and her friends were introduced and I was left feeling a little “off track” and left wanting to know more about the original strain of the story. It did make its way back to George though and him meeting Kumiko, whom he falls in love with. It kind of reminds me of The Snow Child in which a little girl “appears” out of nowhere when a couple build a snow girl in their garden. Magic or coincidence? I was left wondering throughout whether Kumiko was the crane, or was the crane foretelling the arrival of Kumiko or love in general, or was it just coincidence. I like books like this which do not always tie up everything and leaves it open to the readers interpretation – it allows it to be magical and not at the same time. I loved the joint art projects that George and Kumiko come up with and the enthusiasm of everyone towards them. I so wish I could have seen them! 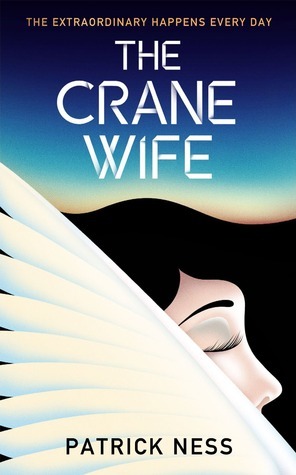 The main thread of the story is interwoven with the story which Kumiko tells of the crane wife through the art tiles she has created. I found that my mind wandered quite a bit when the story changed from the main thread to this one. I’m not sure why really because it was captivating and magical. Because of my wandering mind, I feel that I may have missed some of the symbolism of this story and the parallels between it and the main story. I really enjoyed the book but I was struggling to rate it after I had finished, mainly because while reading it one minute I thought this was an amazing book and the next I was lost and wishing the other thread of the story (or character focus) would return. So I couldn’t decide between 3 stars and 4 stars and I’m still not 100% certain on it. I think I might go for 3.5!